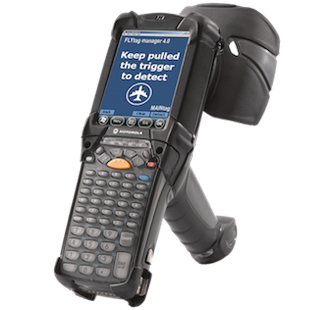 The FLYtag® mobiPACK MC9190-Z supports the worldwide implementation of RFID Gen2 in the aerospace industry. This reader is available in 869MHz or 915MHz versions for international use. It is also specially tailored to the needs of ATA Spec 2000 flyable parts marking. The Air Transport Association (ATA), the trade association for airlines, recently issued expanded guidelines for component parts identification and tracking in ATA Spec 2000. This text includes recommendations for automating part traceability using RFID in Chapter 9.5. RFID technology provides real-time visibility on the entire value chain. FLYtag® mobiPACK MC9190-Z redefines state-of-the-art mobile RFID for manufacturing, maintenance, repair and overhaul for flyable applications. High-memory and low-memory TDS 1.11. The EPC Gen2 standard-compliant read/write functions of the FLYtag® RFID aerospace system allow seamless integration into existing IT infrastructures. Its design provides optimal performance in North America and Europe. End-users needing an out-of-the-box solution can follow an intuitive installation wizard to be up and running within minutes. FLYtag® mobiPACK supports the business changes brought about by the use of automatic identification in aerospace parts marking using RFID. It allows for accurate, automatic and rapid recording and collection of ATA Spec 2000 information on parts. With its exceptional read rate performance, the Motorola MC9190-Z easily integrates into most supply chain, production and maintenance systems.